A total of 3,731 terrorists have been “neutralized” since the start of Operation Olive Branch in Afrin, northwestern Syria, Turkey’s president said on Friday. Addressing a gathering ahead of the ruling Justice and Development (AK) Party’s district congress in Istanbul, Recep Tayyip Erdogan said that the number of “neutralized” terrorists in Afrin was increasing. 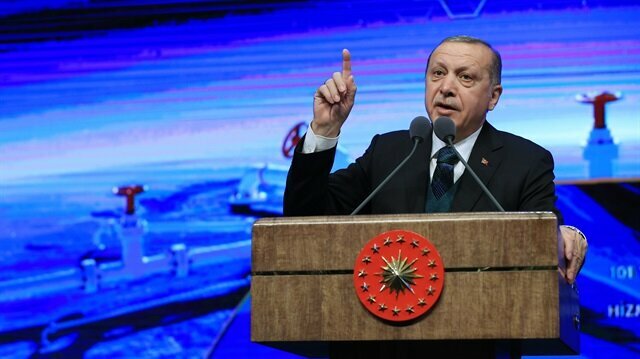 In a bid to reiterate Turkey’s decisive fight against terrorists, Erdoğan also said the country's counterterrorism fight would not end with Afrin. “It will be followed by Idlib and Manbij [Syria],” he added. 'We don’t have to be friends with everybody, but we can be allies with everybody compatible with our interests' Turkish President said. On Sunday, Turkish-backed troops liberated the town of Afrin, which had been a major hideout for the PYD/PKK since 2012. In the face of persistent smear campaigns against the operation, the Turkish General Staff has repeatedly said that the objective of the operation is to "establish security and stability along Turkey's borders and the region as well as protect Syrians from terrorist cruelty and oppression". Turkey’s military on Friday found headquarters buildings of the terrorist group YPG/PKK during security sweeps in areas of Afrin, Syria liberated from terrorists.Turkey launched Operation Olive Branch on Jan. 20 to clear terrorist groups from Afrin, northwestern Syria amid growing threats from the region.On March 18, Turkish-backed troops liberated the town center of Afrin, which had been a major hideout for the YPG/PKK since 2012.Afterwards, the Turkish military began security sweeps for mines, improvised explosive devices, and terrorist hideouts to wipe out any traces of terrorism so residents can resume their normal lives.Video: Turkish forces discover PKK ‘headquarters’ in Syria’s AfrinGaleri: Turkish soldiers finds terror base in AfrinTerror indoctrination in schoolbooksThe former terrorist headquarters included meeting rooms, pictures and symbols of jailed PKK head Abdullah Ocalan on the walls -- underscoring that the YPG/PKK is the PKK’s Syrian branch -- and other propaganda materials of the terrorist group.Security forces also conducted bomb sweeps of the building, which was used by high-ranking terrorist group members.In some parts of the building, the military found explosives planted by the terrorists.Turkish aid group gives hot meals to Afrin residentsNew US national security aide links YPG, PKK terroristsTurkey to train 1,000 Afrin locals as police officers to ensure securityA printing press was also found, along with numerous books and other publications of the terrorist group, including propaganda books for elementary school students.The Turkish military is continuing its security sweeps for mines and terrorist hideouts in Afrin’s city center.The Turkish General Staff has repeatedly stated that the objective of Operation Olive Branch is to establish security and stability along Turkey's borders and the region as well as protect Syrians from terrorist cruelty and oppression.